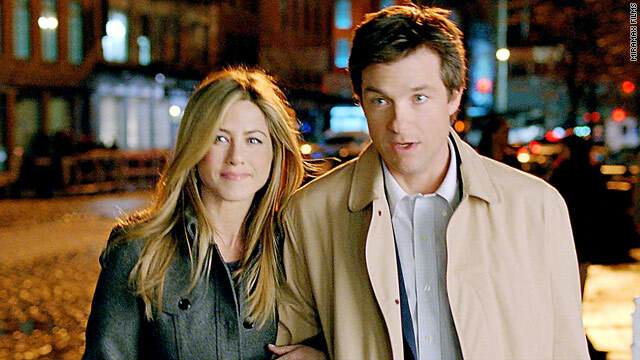 Jason Bateman and Jennifer Aniston's characters are best friends. He's an investment analyst, and she wants a sperm donor. (CNN) -- Now here's a shocker: After a bunch of ho-hum Jennifer Aniston romantic comedies, "The Switch" is actually pretty good. Maybe that's because it's more of a Jason Bateman movie at heart: beady-eyed, needy and compulsively self-critical. No need to get carried away -- it's not exuberantly inventive like "Scott Pilgrim" or as uproariously funny as "The Other Guys" (co-directors Josh Gordon and Will Speck cut their teeth on Will Ferrell's skating romp "Blades of Glory"). But if you're looking for a few laughs at a more-mature couple movie, this is probably your best bet right now. Based on a short story by Jeffrey Eugenides (who's also the author of "The Virgin Suicides"), Allan Loeb's witty screenplay boldly skips the obligatory meet-cute scene. Wally (Jason Bateman) and Kassie (Aniston) are the best of friends. He's a neurotic investment analyst and a lousy dresser. She's looking for a sperm donor. But not just anyone: someone with a great sense of humor, someone tall, someone willing to meet up and look her in the eye. Wally's exception to this idea is not religious or ideological, but on a gut level it feels all wrong. Mostly, we can see, it's because he never even made the list, and that has to hurt. Even if he hasn't admitted it to himself (let alone Kassie), she is the one for him. Even if we're primed for it by the trailers, the switch itself is a bit of a stretch. Drunk at Kassie's insemination party (who wouldn't be? ), Wally "accidentally" spills the donor's seed and replaces it with his own. Just how drunk is he? Drunk enough that he forgets all about this episode for seven years, while Kassie brings up their kid in blissful ignorance and out of state. It's only when mother and child return to the Big Apple that Wally begins to wonder about his intuitive connection with little Sebastian, a first-grade hypochondriac who collects picture frames for a hobby. Wally's rival for Kassie's attentions isn't Sebastian, but the sperm donor -- another of Patrick Wilson's too-good-to-be-true guys: super-fit, super-smart and superficial. The movie spends too much time affirming the bond between the angsty bachelor dad and his even more introverted boy (a touching performance by Thomas Robinson), and not nearly enough trying to convince us that Aniston and Bateman are a match made in heaven. Their chemistry never gets beyond the test tube level -- Wilson really does seem a more likely prospect. But it's a kick watching Bateman carry off a genuinely unromantic lead -- Wally almost never says the right thing. He's funny enough to have us pulling for him regardless. Bateman gets a major assist from Jeff Goldblum in the obligatory sidekick role. It feels like eons since he starred in "Jurassic Park," but Goldblum's quirky, off-the-cuff line-readings keep jerking "The Switch" back on track.